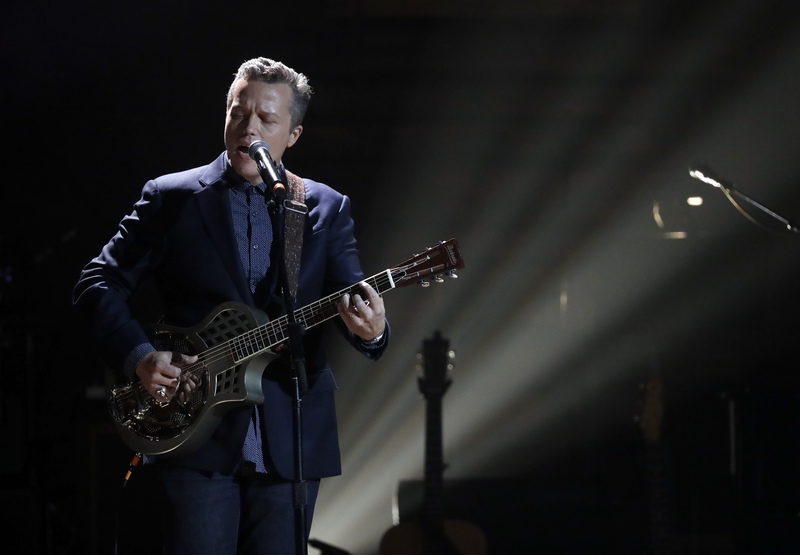 Jason Isbell performs during the Americana Honors and Awards show Wednesday, Sept. 13, in Nashville, Tenn (AP Photo/Mark Zaleski). The best singer-songwriters possess a rare ability to share their personal experiences through word and melody, touching upon universal themes that settle and resonate deeply within the heart of the listener. Once received, this gift often stokes the embers of empathy, encouraging contemplation and action. The alt-country artist Jason Isbell has embraced this skill with a gentle confidence, consistently creating some of the most passionate and socially engaged music out there today. In his late 30s, Isbell possesses a thorough appreciation for the human condition, as one who has slogged through a divorce, has battled alcoholism and was fired (unanimously) by his former bandmates in the Drive-By Truckers. He has also, thankfully, savored some of life’s great blessings, including falling in love with the musician Amanda Shires, who plays fiddle in his band the 400 Unit, becoming a father, and finding popularity and acclaim as a musician. In his late 30s, Isbell possesses a thorough appreciation for the human condition. A song like this demands attention and rumination, and it elicits appreciation for the English language’s capacity to manipulate us (in the positive sense of the word). Many of Isbell’s songs invite us to probe his wounds, to run our fingers across his soul’s scar tissue and be reminded that beauty and pain can be inseparable. We recognize ourselves in his brokenness, and as we savor the music, we feel the ache awoken by gentle melodies married to striking poetry. Twenty-four is the standard number of frames of film that move by the eye every second of viewing. Swiftly and without warning, everything that we think we know can be turned on its head, disorienting us and making us as vulnerable. This is good and necessary, at least on occasion, for it is only in this state that we can authentically invite God into our lives, when there is no illusion that we are in control or that we know who and what God is—we are left as one gasping for air in a vacuum and we have no other choice. Reflecting on this song has assisted me in blowing up some of the childish theology I had carried into adulthood and has aided me in a quest toward something more mature. Isbell wants to be a better man and he uses his songs as a road map to get there. Isbell wants to be a better man and he uses his songs as a road map to get there. He is clearly embarrassed by his own contribution to the evils of sexism and racism, but that doesn’t prevent him from challenging us all to admit our own culpability in these matters. We live in a culture that immerses us in music. Much of it is floating in the background, barely noticed by our consciousness, maintaining us in a constant buzz that robs us from contemplative silence. But there is also music that is challenging and rich with vibrant meaning. It beckons us to lock horns with it and experience it pushing and pulling our spirit. This is its own form of contemplation. Ideally this music also moves us to action toward a better world for everyone. And if we pay close attention we will find Jason Isbell right alongside us, helping us to hope by doing what God put him here to do. David E. Nantais is the Mission Leader at St. Mary Mercy Hospital in Livonia, Mich., part of the Trinity Health System.